The English weather is so unpredictable so I know you won't be surprised to see that I'm wearing knitwear yes, knitwear in August. If I'm completely honest I prefer the colder weather, I just LOVE to layer! (And because it means that I can finally start wearing the coats I've been storing away since last year's sales, ha. Totally not joking.) This Gestuz colour block biker jacket is a steal! I've gotten so much wear out of these cropped flared jeans since I bought them a few weeks ago. 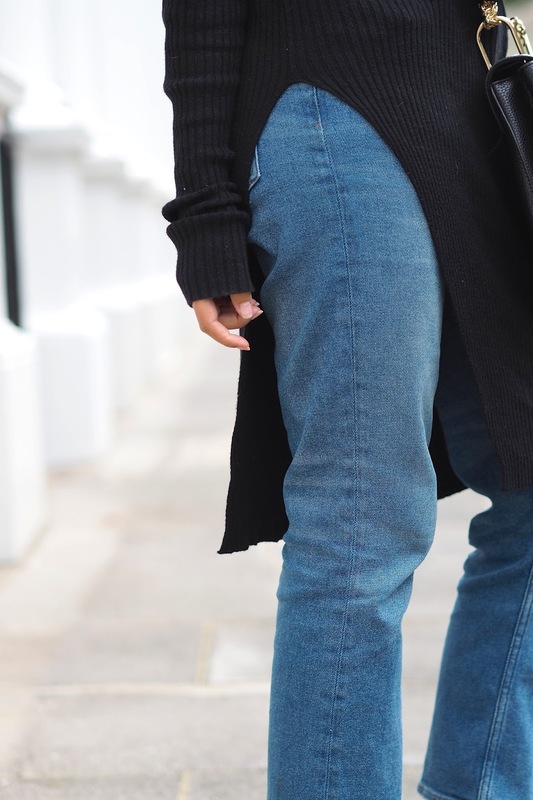 They are now out of stock but these raw hemmed jeans are very similar. I feel like fashion is moving away from the dominant leg lengthening 70's flare and edging towards a kick flared jean-these are my favourite! this is such a gorgeous look! i know how you feel loving cooler temperatures as they're better for layering!